Since I just put a new barrel on my F-class rifle this spring, I figured it might be a good time to discuss load tuning for long range shooting. Getting the most accuracy out of your rifle is one of the most important aspects of load tuning. For long range shooting in particular, using a load that produces the least amount of vertical variation is vital. There are several steps to the process that I use, so I will go through the basics of each. When I first get a new barrel installed, I like to determine what the loaded cartridge “jam” length is. I do this by taking an empty case (no powder or primer) that has been neck sized with the proper bushing (I like to shoot for 0.002 smaller than the loaded cartridge neck diameter) and seat a bullet long in it so that the throat of the rifle will move the bullet back into the case when I close the bolt. I close the bolt several times until the bullet stops moving back into the case at which point I use a comparator with my calipers and get a length measurement on the cartridge. This is what I consider to be the “jam length” for this barrel and chamber. I came up with 3.477 as the “jam length” for this particular barrel. Next, I will fire form some brass using a starting load of powder and bullets seated to “jam” while breaking in the barrel. My barrel break in process is not very technical; it’s mostly just to get the brass formed and the rifle sighted in. I do clean every 5 rounds or so just because I feel like I have to. Once I have the brass formed, I use them to load for a “ladder “ test to see what powder charge the rifle likes. With a ladder test, you take your starting load and load one round each with a slightly increasing amount of powder until you reach your max load for that cartridge. You then fire each round using the same aiming point to see where the bullets start to form a group. For this barrel and cartridge, I started at 53.3 grains of H4831SC powder and increased the load by 0.3 grains until I reached 55.7 grains. I always seat my bullets to “jam” when doing a ladder test. We will determine the final seating depth in another test later. It’s usually best to shoot this test at a minimum of 200 yards because at closer ranges the bullets will impact too close together making it hard to determine which load works best. I shot this test at 300 yards. Now that we’ve settled on a powder charge, I want to find the seating depth the rifle likes. I usually start at jam length and move the depth in 0.003 until I get to 0.015 deeper than jam. I load 3 rounds at each depth using the 54.5 grain powder charge and shoot a group with each depth at 150 yards. As you can see from the target, the first two groups are not good at all. Next one looks good and is the smallest group on the target. The next three are not quite as small but the vertical location on the target is almost the same which indicates a sweet spot which will help keep the vertical stringing to a minimum on target. I went with 3.470 which is right in the middle once again and should give some flexibility with the seating depth. For more information about load development, please contact the Sierra Bullets technical support team at 1-800-223-8799 or by email at sierra@sierrabullets.com. Disclaimer: Load data represented here may not be safe in your rifle. This entry was posted in Competitive Shooting, Reloading and tagged F-Class Rifle, load development, load testing, load tuning. Bookmark the permalink. Loads for shots 2-3, 4-5-6 and 7-8 all have less than caliber (bullet diameter) vertical spread. At 300 yards, there’s no words good enoght to describe it. Any one of those loads in those ranges may well be most accurate. Who knows why shot 9 was were it landed. 3-shot groups typically have an extreme spread range of at least 4X to 6X from smallest to largest as any results from benchrest matches 100 through 300 yards show at least that much for 5-shot groups. Therefore, I think those 3-shot groups are statictically equal. I’d test each load with a 20-shot groups. Those are sometimes shot in F class events. How each load holds up for 20 shots is most important, at least to my reasoning. 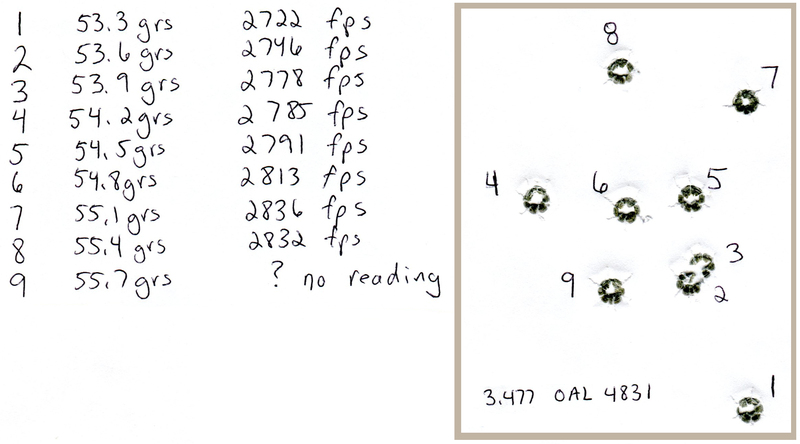 If Sierra shoots 10-shot groups testing their bullets for quality, why not shoot at least that many for your own stuff? Oops, change my 300 yards to 150.for the 3-shot group stuff.